New facility’s doors separate ambient, refrigerated and freezer storage to reduce energy consumption while optimizing uptime. Gandhi Automations Pvt Ltd is one of the leading diversified suppliers to the pharma sector, serving more than 50 customer accounts in more than 23 cities Pan India. Clean room doors (Prime Clean Reset) are designed for inside applications requiring limitation of leak flow. The perfect sealing properties of Prime Clean Reset provide environmental control and protect the inside environment against draughts, dust and dirt. Clean room doors provided by us also has self- repairing system. 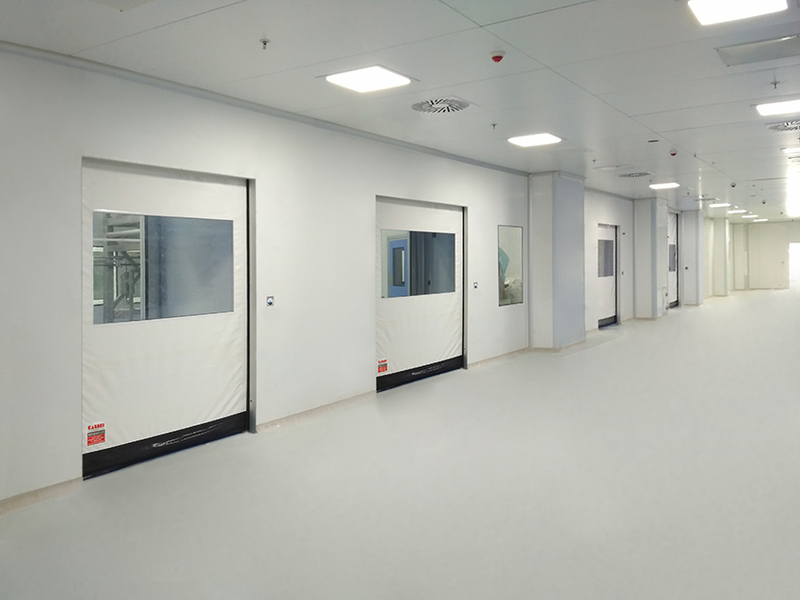 One of the most imperative aspects of clean rooms is the Door you choose for clean room facility. Time for which door is open will play a critical factor in avoiding dirt, temperature, humidity etc. Opening and closure of door has to quick enough to isolate the two areas. At Gandhi Automations Pvt Ltd we provide Clean Room High Speed Doors specifically designed for above purpose. 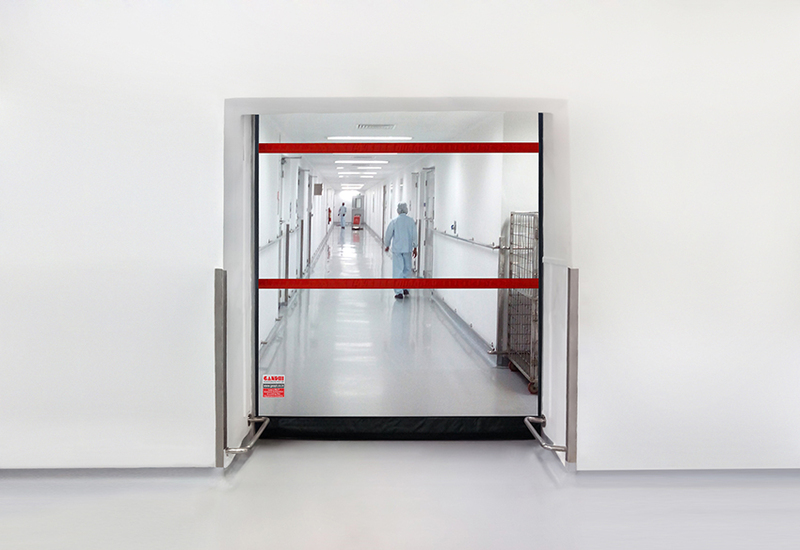 Our Clean Room High Speed Doors are best suited for pharma industries where you need to have controlled environment. The opening and closing of door is fast enough to separate two areas. In the high-volume, 24/7 facility, turns in the cooler happen twice a day and, in the freezer, inventory turns occur every day and a half. With traffic streaming in and out of the building through 47 dock doors, losing a single high-traffic door could severely jeopardize deliveries. Prime Freeze High Speed Doors are a perfect solution where cold storage with negative temperatures to as low as – 22°F is required. The curtain is made of reinforced PVC vinyl with heated side guides. Optionally a special and innovative insulated flexible curtain is also available. High Speed Freezer Doors are the solution when temperature control is critical and where forklift traffic is high. High-Speed Freezer Duo not only helps maintain temperature but also in human safety. High-Speed Freezer Doors have a revolutionary soft bottom edge and sensor combine to ensure operator safety at all times. High-Speed Freezer Duo doors curated by Gandhi Automations are sturdy, dependable and an ideal fit for maintaining temperature control. To prevent ice formation during intensive cooling, the high-speed freezer duo doors have a functionality of partial and full opening. Its intelligent dual curtain technology - simultaneous open-and-close operation has blower/dryer to maintain temperature balance. Fast door speed also reduces the likelihood of panel collisions with tall-mast forklifts. In the event of a collision, the self-repairing system automatically resets the panel back into its guide without human intervention. To avoid accidental contact with door panels, an LED safety light system along the door columns warns employees when the door is about to close and when it is actually closing. Two photo eyes,(cells ) a dual-pneumatic reversing edge and threshold warning lights will reverse the descending door panel if an employee is in the doorway.